Car dealer increases payout a penny from $0.15 per share. Automotive retailer Group 1 Automotive (NYSE:GPI) announced yesterday its first-quarter 2013 dividend of $0.16 per share, a penny larger, or 6.7% more, than the $0.15-per-share payment it made last quarter. The board of directors said the quarterly dividend is payable on June 17 to the holders of record at the close of business on June 3. 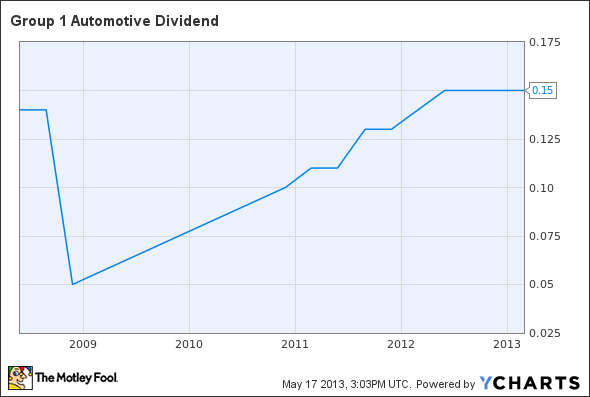 The car dealer has paid a dividend every quarter since at least 2006. The new dividend payment equates to a $0.64-per-share annual dividend yielding 1% based on the closing price of Group 1 Automotive's stock on May 16. GPI Dividend data by YCharts. Chart does not reflect latest dividend increase.